The wireless video feed that all FPV miniquads share is the core feature that makes them so compelling to fly. In decades past, pilots were restricted to flying aircraft by spinning in circles while tethered to the aircraft with physical wires – so called “control line” flying. These days, the wires have been replaced by antennas and not only are we able to control our aircraft wirelessly, we can don goggles and pretend we are inside of the aircraft! All that only works because of the antennas on our drones. We are free to go almost anywhere we please – as long as we respect the limitations of our radio link. Understanding those limitations is a key to not only being a safer pilot, but also protecting your gear from signal loss or worse. 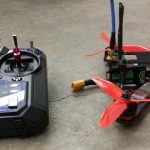 My goal with this article is to bestow upon you everything you need to better understand how the antennas we use for radio control and FPV work. Think of standing in a pitch black field. You hook a light bulb to your quadcopter and start flying it around. Your goal is to now put together a video camera system that is sitting on a tripod right next to you that will always be able to keep the light emitted by your quadcopter in view. How do you set up this scenario? Do you attach a massive power source to the lightbulb so that it is super bright? Do you use a 360 degree lens on your camera or do you use multiple cameras with zoom lenses? Do you buy a camera with more megapixels? This analogy is so powerful because light emitted from a bulb is a form of electromagnetic radiation, just like radio waves. In many ways, the lenses on our eyes and cameras are just antennas that specialize in receiving visible light. The intensity of the light source is the power output of the VTX (this is measured in milli-watts or mW). 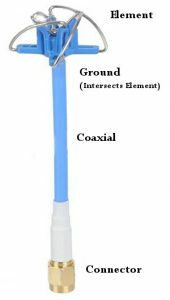 The type of light source (light bulb, flashlight, flood light, etc) is the antenna type on the VTX. The type of lens you have on your camera is the antenna type on your video RX. The sensitivity of the camera (often expressed in “megapixels”) is the sensitivity of your video RX. I find thinking of the radio waves used in our radio control and video transmission systems as simple visible light immensely useful in better understanding the mechanics behind them. I’ll continue using this analogy more as I explain how antennas work in the rest of this article. What does an antenna do? The purpose of the antenna is to convert oscillating electrical energy into electromagnetic radiation and vice versa: converting electromagnetic radiation into oscillations of electrical energy in a circuit. Electromagnetic radiation is simply a scientific term for “radio waves” – it is the physical “substance” that carries video, sound, and data over the airwaves. 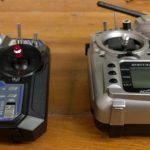 In a typical miniquad, there are two radio systems in action: the radio control system for piloting your quadcopter and the video transmission system for seeing through the FPV camera. 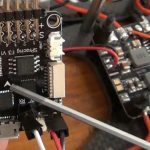 The transmitting elements of these two systems are the radio transmitter you hold in your hands and the video transmitter on-board the quadcopter. The receiving elements are the on-board RC receiver and video receiver respectively. More simply, you control the direction of your quad by sending commands via the radio transmitter in your hands to the RC receiver on your quad, and receive video broadcast from the VTX on your quad to the FPV goggles on your head! Let’s talk specifically about the video system. In this system, the video transmitter takes an analog video signal from the camera as an input, and transforms it into pulses of electrical energy that oscillate 5,800,000,000 times a second, or 5.8GHz. This energy is then allowed into the antenna which converts it into very “bright” 5.8GHz radio waves. When properly configured and positioned, these waves are picked up by the second antenna mounted on your FPV goggles. Depending on how far away your quadcopter is, these waves will be significantly “dimmer” but still visible to the RX antenna on your head. That antenna converts the waves back into electrical oscillations inside of your goggles which then proceeds to convert this energy back into an analog video signal – the exact opposite process as what happened in the video transmitter. 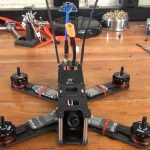 Are antennas required for quadcopters to work? Those of you with some experience in the hobby might be getting confused right about now. If you’ve ever pulled out your Fat Shark video receiver goggles and plugged them in without an antenna – you know they still work. If the antenna is the device responsible for converting to and from radio waves – how can this be? 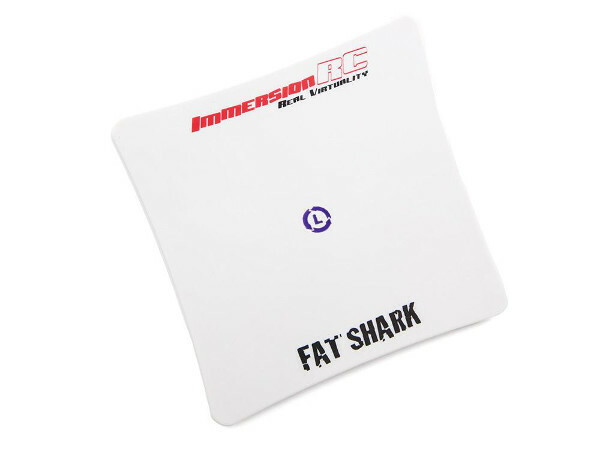 The answer is that in the absence of an antenna plugged into your Fat Sharks or your VTX, the small SMA connector you use to screw in the antenna becomes the actual antenna! This leads us into a very important concept of antenna design: Any object made of conductive material is an antenna. This includes SMA connectors and the copper traces inside of the PCB of your VTX. It also includes the carbon fiber frame of your quadcopter. So,without a good antenna hooked up to your goggles, your video receiver system uses the really crappy one made from just the bare connector. It doesn’t work well – but it works! Strand or strip of conductive material that carries the oscillating electrical signal and “transfers” it to the air as radio waves. Every antenna has at least one element. Some can have many radiating from a single point. The ground plane of the antenna is tied to the electrical ground of the device. It is also made of conductive metal and can be anything from a second strip of wire or metal to a plate of metal. It serves as an electrical reference for the state of the element. In some cases, the element is tied directly to ground such that the ground plane and element are the same wire. A properly tuned ground plane can amplify the radio signal emitted or received by the element of any antenna. The structure, usually made of plastic or acrylic, is anything that is not conductive and provides physical support for the antenna. 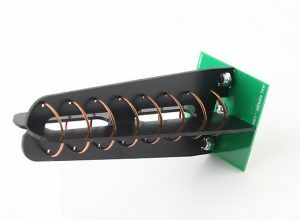 For many complex antennas shapes, a structure is required to prevent the antenna from getting bent and becoming useless from simple wear and tear. You are probably most familiar with the plastic structure found on rubber ducky antennas. These ubiquitous antenna have all the other antenna components hidden under thick coatings of rubber-like plastic structure. Coaxial cable is a special type of sheathed wire that can carry electrical signals from one point to another without emitting radio signals. Remember how I said earlier that every object made of conductive material is an antenna? Well – this would include the wires you want to use to send signals from your VTX (for example) to the actual antenna. Without using coaxial cables for these wires, the “tuning” (see below) of the antenna would get thrown off and your signal would be really bad. Some antennas do not have coaxial cables because the element and ground plane is connected directly to the circuit board emitting the electrical signal. Since our miniquads are made of conductive carbon fiber, though, getting the element as far away from the frame is good practice. The connector of the antenna is what physically connects the element and ground plane to the electrical components on-board the electrical signal source (TX) or sink (RX). In our hobby there are a few common connectors you will run into. The SMA connector is a favorite for video transmission equipment. Radio control receivers, on the other hand, use U.FL and IPEX connectors, which are far more compact. How does an antenna actually work? You don’t really need to understand the mechanics behind antennas to design and operate an effective radio system. Being that this is a beginner’s article, I don’t want to dive very deep into this subject, but I will give a shallow explanation. If you are really interested, I recommend you check out antenna-theory.com or do some Googling. An antenna doing it’s thing. Image courtesy of Wikimedia Commons. A tuned antenna works on the theory of resonance. 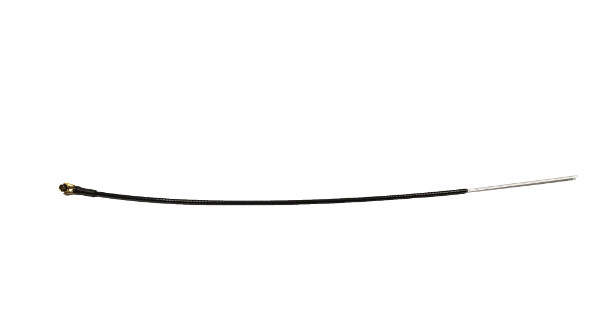 In a transmitter antenna, electrical energy is imparted through the connector up to one end of the element. This energy is formed by fluctuating voltages that rapidly transition from positive to negative. Let’s assume that we start watching an antenna at some point in time where an electrical impulse of 5V is being applied to the very start of the antenna element. As that 5V flows through the element at the speed of light, the voltage it is also being simultaneously changed at the connector end. As the 5V impulse reaches the mid point of our antenna, the start of the antenna element is now being driven to -5V because the electrical impulse has gone through half of an impulse wave. By the time the original pulse of electrical energy reaches the end of the element, the impulse at the start of the element has completed a full oscillation and 5V is now applied to that point of the antenna again. If you’re still with me, you’re seeing that this antenna is containing an entire wave of electrical oscillations at all time. It is “tuned” to the speed of those oscillations and the speed of light inside the wire. When you can contain an entire wave, or a fractional portion of a wave in an antenna – it starts to resonate, resulting in a very clean, strong radio signal being emitted from the transmitter antenna. A receiver circuit works in a very similar way: the radio waves oscillate back and forth across the surface of the element and begin to build up into something like a standing wave across the antenna. This wave greatly increases the electrical power output of the element into the receiver circuitry. If you’re familiar with resonance, you know that sizing of the thing you want to resonate is critical. A tuning fork, for example, is sized so that it resonates with one particular note, and no others. The same is true for antennas. An antenna is sized to resonate at a very particular frequency. The sizing is actually very easy to understand. It is always proportional to the wavelength of the radio signal that is being received or transmitted. I won’t get into what wavelength is, but rest assured that it is pretty easy to calculate using online tools. You may be wondering how transmitter power output plays into the antenna equation. It is easiest to think of the power output of your transmitter as the total amount of radio energy your antenna will be able to output. The antenna is then responsible for shaping and directing that energy, as we will discuss in later sections. The best analogy for transmitter power is the brightness of the light in our dark field analogy. As you turn up the power, the light reaches further – but there are diminishing returns. When dealing with light bulbs – feeding more power produces more light and more heat. In fact, a progressively higher proportion of the energy put into the bulb gets wasted as heat as you apply more and more power. This exact same thing happens to radio transmitters. Most 200mW transmitters have no problem dissipating the heat they generate. It gets to the point that 1W transmitters generally need dedicated heat sinks to properly cool down and 2W transmitters will come with active fan elements. Along these lines – the transmitters in our hobby use low-grade circuits that are generally rated for consumer electronics, which never emit over 100mW of power. When you amplify the power output of these devices to 1W or higher they start spewing out a ton of extra radio noise out of the antenna alongside the heat. This will make other unshielded electronics on your aircraft start to act up. All the electronics in our miniquads are unshielded which means they are all vulnerable to these problems. Second, increasing power does not result in a linear increase in the distance the light reaches. You may have experienced this when plugging 60W and 150W bulbs into the same socket and turning them on. The 150W bulb is noticeably brighter but it’s light will not reach double the distance of the 60W bulb. Again – this holds true for radio waves. To understand why, you have to understand that light and radio energy have to fill a volumetric space. Each extra unit of distance you want the light or radio waves to travel becomes exponentially more costly of power. This can quickly get out of hand. So how do you get ultra long range without increasing the power of the transmitter? By shaping the beams of the radio waves coming out of your transmitter – which we will discuss next. 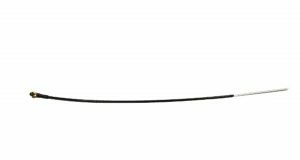 The most basic choice you need to make when choosing an antenna is its directionality. Do you want it to focus it’s beam in a single direction, gaining a significant range bonus similar to a flashlight? Or do you want it to radiate radio waves in all directions without bias like an uncovered light bulb? The latter antenna type is called an “omni-directional antenna”. Omni-directional antennas “shine” their radio waves equally in all directions. You can generally tell if an antenna is omni-directional because it will be symmetric when looking at it from the top down. A “directional antenna” is, by definition, any antenna that is not omni. Directional antennas radiate preferentially, choosing to partially or fully ignore coverage of an area behind them in favor of boosting the strength of the radio waves right in front of them. The classic example is a spotlight, which only lights an area right in front of it. Directional antennas vary wildly in performance. Some, like the patch antenna, only have a mild directional preference but still retain some good coverage behind or on the sides. Others, like the yagi antenna are more akin to a laser beam: they produce intense radio waves in a very narrow beam right in front of them while completely ignoring the rest of the environment. One of the more difficult aspects of radio waves to visualize is the concept of polarization. Polarization of radio waves occurs in one of two distinct types: linear and circular. However, if you take the 2nd antenna and rotate it 90 degrees in any direction, you’ll see that the radio waves all of a sudden have nothing to hit in their oscillations up and down. What was once a very good link between transmitter and receiver is now total garbage. You can see this concept being drawn out in the image above. The first two images on the left depict vertical and horizontal linear polarization. What do you think would happen if you swapped the antenna strips in these images? To go back to our light analogy, this concept identical to that of polarized sunglasses. If you’ve ever worn these sunglasses while looking at an LCD screen you’ll know that if you turn your head in certain orientations the monitor will go totally dark. This is because there is a 90 degree polarization mismatch between the light emitted from the monitor and the polarization filter in the sunglasses. All incoming light is blocked and you totally lose your signal. Radio waves don’t have to just go up and down or left and right, though. They can be “spun” in a circle so that they oscillate in all directions. This is the concept behind circular polarization and is the rightmost diagram in the image above. If you’re in the hobby, you’re familiar with circular polarization because almost all video systems use it. The reason for this is because there if you wear polarized sunglasses and look at a circularly polarized monitor, there is no orientation you can turn your head where the screen goes dark. This is an very important concept when applied to racing miniquads, which fly with their butts in the air, upside down, left side up, etc etc. Circular polarization does have an important consideration to it, though: the direction of the radio waves are “spun”. There are only two directions: right hand circularly polarized, or RHCP and left hand circularly polarized, or LHCP. If you spin a radio wave with one antenna, you need to make sure you “catch” that radio wave with another antenna with the same spin. Therefore, you should only use RHCP antennas on your receiver if your transmitter also has an RHCP antenna. The same is true for LHCP. Failing to do this will result in a significant loss of signal. This is, in fact, a really useful concept. Since RHCP antennas do not like to receive LHCP signals, you can actually pack more pilots onto the 5.8GHz transmission band without interference. You do this by having the pilots fly alternating RHCP and LHCP antennas as you move up the frequency band. So CH1 will use RHCP, CH2 will use LHCP, CH3 will use RHCP and so on. This sort of strategy will greatly increase signal / video clarity for all pilots at large flying events. This is the reason we recommend anyone looking to race or fly with other pilots buy both an LHCP and RHCP antenna set for their quadcopter. It’s important to realize that the advertised gain of an antenna is almost always the maximum gain of the antenna. All antennas connected to the same transmitter radiate the same amount of power – the only difference is in how that power is actually radiated. Going back to our dark field – think of taking a flashlight with an adjustable lens. You can focus the lens to put an extremely bright spot exactly where the flashlight is aimed but not provide any light to the surroundings, or you can bring the focus out and light up a large area. It’s one or the other – not both! Anytime you add a reflector on to light you are sacrificing the light strength in some areas around the light to focus it more on other areas. The same goes for an antenna. You may be able to quadruple the power of the antenna straight forward, but it will mean that you have quartered your range behind you in most cases. In this chart, the E-plane is the radiation pattern viewed from the side of the antenna, while the H-plane is the pattern as viewed looking down on the antenna. The circles in the chart will generally have gain numbers expressed in dB, but in this chart they do not. As you can see, a dipole antenna is very good at spreading radio waves equally in all directions, but has a significant weak spot directly over the antenna. This demonstrates an important point when flying your model at high altitudes – don’t fly right over yourself! It is the area where the gain is weakest and you have a high likelihood of losing signal. Image courtesy of antenna-theory.com. If you are interested at all by the material in this article you need to go check out their site. They have these same plots for all types of antennas – making understanding their performance much easier. In some plots like the ones shown above, the areal gain is shown using colors. You can clearly see from this plot that the antenna will have amazing range straight in front of it but will almost no range to the sides or behind it. It’s a shame that most manufacturers don’t put out this data on their own, but you can still get by with making the assumption that the higher the gain of an antenna, the more directional it is. If you want to use highly directional antennas, you should consider using multiple diversity receivers and reading a bit more on antenna theory after finishing this article so that you can make some estimations on your own on what kind of performance you can get. 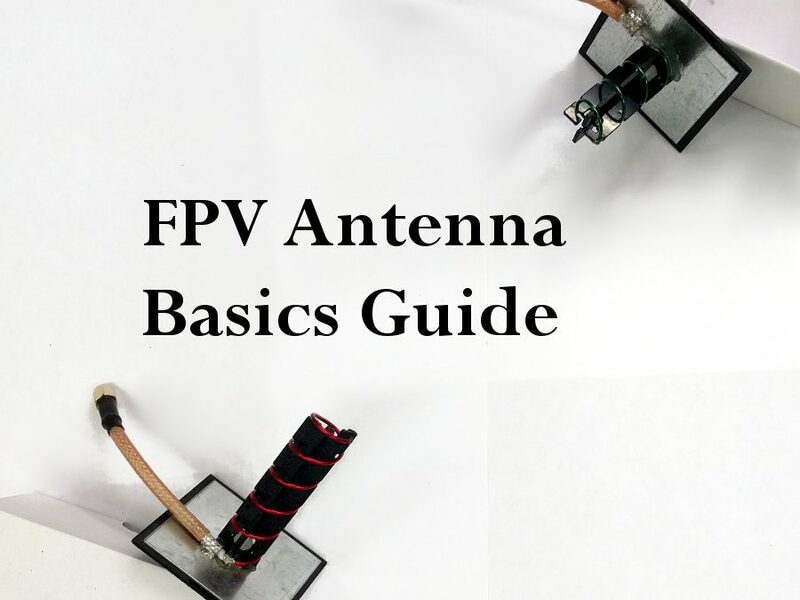 These are the simplest types of antennas. They consist of just a solid wire which makes up the antenna element. 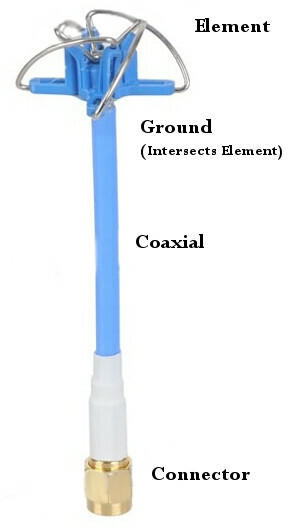 Dipole antennas also add a second wire which serves as a ground plane. By stacking dipole antennas on top of each other, you can increase the gain of the antenna but reduce the effectiveness of the antennas vertical performance. When you see very long rubber ducky antennas on transmitters, this is exactly what is being done. These are very similar to dipole antennas but add “spin” to the radio waves, removing their linear polarization. Circularly polarized antennas provide fantastic performance regardless of their orientation relative to one another. Patch antennas are a mildly directional antenna type that simply look like flat plates. They offer around 2-3x the performance of their linear cousins when flying in front of their face. 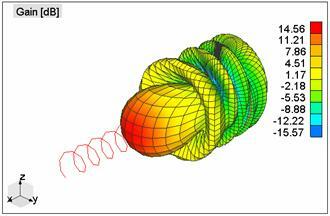 Helical antennas are a great way to get high directionality out of a circularly polarized antenna. They are especially cool because you can increase their gain and directionality by simply adding more coils to the end. 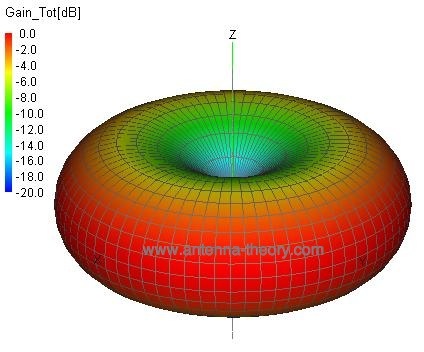 Helical antennas with just 1 or 2 turns have performance very similar to a patch antenna. However, adding 6+ turns can make improve the range of the antenna by orders of magnitude. Now that you’re starting to get a picture of how radio wave energy is transmitted, you can start visualizing how the average radio system works. First, remember that every radio system is made up of a transmitter, transmitter antenna, receiver antenna and receiver. All four elements work in harmony to transmit information from the transmitter circuitry to the receiver circuitry. With the video system, the transmitter is generally placed on the quadcopter. 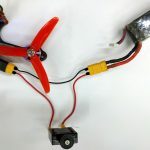 Because the quadcopter is always moving and rotating, it would be very ineffective to use a directional antenna – how would you keep the antenna oriented at the pilot’s video receiver? For this reason, most pilots exclusively use omnidirectional antennas on their quadcopter. However, the receiver antenna on the video system can be highly directional – because you as the pilot can choose to fly only out in a certain direction and pick an antenna that aims in that direction. This brings up an important point – when building a radio system, the antenna on the transmitter and the antenna on the receiver are equally effective at boosting overall range. In our dark field analogy, it is equally as effective to add a tight reflector on the light and point it at the camera as it is to add a very high zoom lens on the camera and point it at the light. Forgive the crude drawing, but it serves the point – if the radiation patterns from the transmitter and the receiver intersect, you’re going to get reception. When thinking of the antennas on both the transmitter and receiver, I like to think of the volumetric radiation plots discussed above. The goal is to make it so that there is an intersection between the radio wave volume coming out of the transmitter antenna and radio wave volume going into the receiver antenna. As long as you have intersection, you have radio reception! There are many other performance figures besides gain when studying antenna design. These include bandwidth, impedance and axial ratio for circularly polarized antennas. For more information on these concepts, we recommend you go on to antenna-theory.com. Realistically, it is very hard to determine how an antenna system will perform from these figures. I have personally seen antennas that claim to have near-perfect axial ratios (which is supposed to improve performance) be vastly outperformed by antenna that do not. As long as you are buying your equipment from a manufacturer who has basic knowledge of how to design antennas you should really only need to worry about the gain. Where and how you mount your antenna can have a huge effect on the range you get out of your radio system. This is because improperly mounting an antenna can significantly reduce it’s gain by blocking areas where radiation would otherwise go or by causing reflections that cause interference. The fundamental rule to follow when mounting your antenna is to keep it clear of any and all conductive material. As mentioned earlier, all conductive materials are antennas and if the radio waves hit some in between being transmitted to your receiver, those materials will absorb the radio waves and prevent your receiver from getting as much, if any, signal. Mount your antennas free and clear of anything conductive – including the frame! The other thing to consider is that when mounting linear antennas like the monopoles used in radio control receivers, polarity should be taken into account. Wherever possible, it is best to cant the receiver antennas away from each other so that if one antenna gets a poor signal due to polarity differences, the other gets a good signal. 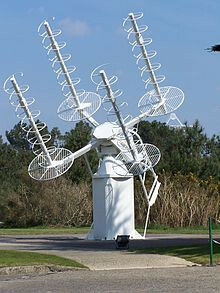 The above picture is a bad example of this – both antennas are pointed straight up. Do as we say and not as we do! This is the most customizeable radio feature an RC hobbiest has at his disposal. Antenna gains of up to 16dB (equivalent to 40x output power!) are possible with multiple-diversity set-ups. Similar to RX antenna gain, this is a very easy factor to tweak. 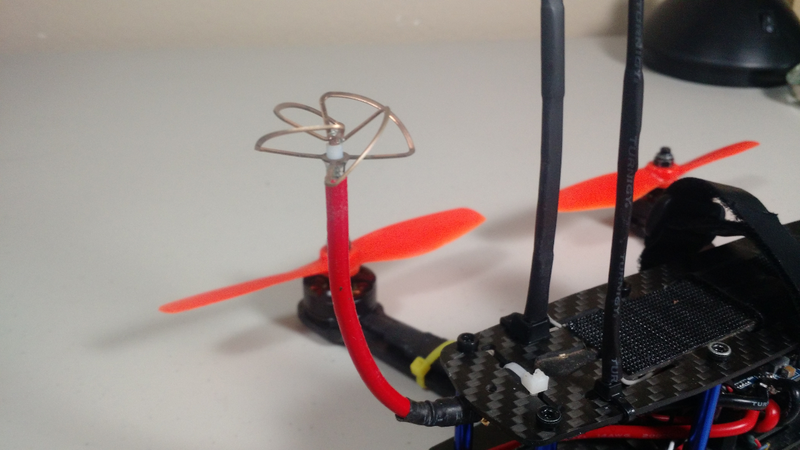 Simply plug in a new antenna to your quad. It is secondary to RX gain because in miniquads, you must use an omnidirectional transmitter antenna, so the gain options are much narrower. For radio control systems you have no control over this. For video transmitters, we do not recommend using transmitters that output over 600mW of power. Realistically, we recommend you stick to 200mW transmitters to avoid the heat and noise problems described above. Again, for radio control systems you have very little control over this. Most manufacturers don’t even publish sensitivity figures. Furthermore, just because a receiver is more sensitive doesn’t mean it will be able to actually decipher a very low-gain signal. Even with video systems there isn’t much selection, but we recommend everyone use a video receiver based on the RX5808 chip on their receiver – this is simply the best chip on the market today for 5.8GHz video reception. To combine all these factors, we found a really useful site at www.maxmyrange.com. It is basically a calculator that shows you the maximum range you can expect with a given combination of TX and RX antenna and TX output power. Once you start using highly directional antennas on your receiver for maximum range, you’ll want to start looking into diversity receiver systems. The way these systems work is they chain 2 or more receivers together and only output the signal from the receiver with the best reception of the radio signal you have tuned in. What you do is put several highly directional antennas on a diversity system so that you cover all of the area you want to fly in. With this done, you’ll get all of the benefits of the antenna gain multipliers with none of the downsides. There is no limit to the number of receivers you can have on a diversity system, but if you want to buy off the shelf equipment the biggest system we know about is the Turnigy Overlord system with 6 antenna inputs. 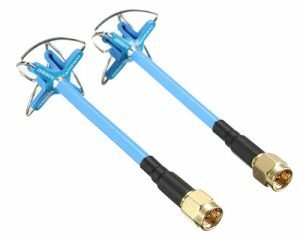 Some crafty manufacturers like to add the illusion of all the benefits of diversity antennas by simply wiring the output of two SMA connectors together into a single receiver. This scheme is often called “dual antennas” and is not even close to as good as full diversity, but it does provide some interesting benefits. When you wire two antennas together, the signals that they receive combine inside of the wiring, creating what is essentially one big antenna. This combination can be constructive or destructive: poorly placed dual antennas can drastically reduce range due to destructive interference. One thing to keep in mind if you have a dual antenna headset is that antenna placement is critical. If you are having range problems, try bending your antennas in different directions, or try removing one antenna altogether. Dual antennas can improve resistance to some types of interference, but it can never improve things by more than half of what diversity can achieve. The reason is that if you are in a situation where one antenna is getting a totally dead feed and the other antenna is getting the full signal, they will combine and produce a signal going into the receiver with half strength. By contrast, a diversity receiver would simply pick the antenna with the best signal and get the full strength. In general, try to steer clear of dual antennas unless you are getting a good price. 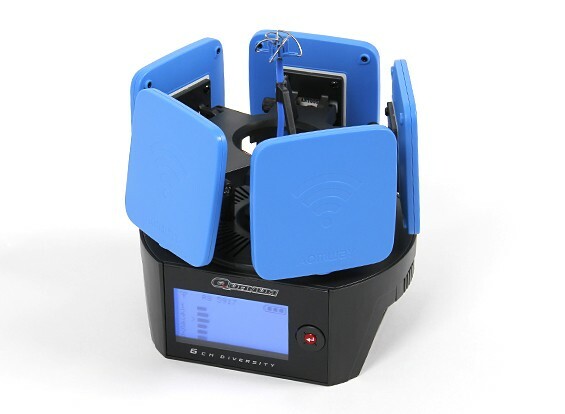 If you don’t want to shell out for a ton of receivers hooked together in diversity, the only other option is to outfit your gear with an antenna tracker unit. With an antenna tracker, a highly directional antenna is physically pointed at your aircraft. This can be done using a gimbal controlled by a computer or by your buddy hanging out with you aiming the antenna like a gun. This is a simple and effective way to get all the benefits of a highly directional antenna without shelling out a ton of money. Just be careful you don’t lose aim!